Becoming a warm-up band or an opening act requires some legwork, but also some basic etiquette once you've landed the gig. Here are tips for doing both successfully. Playing a show as the opening band is a fast way to boost your music career. You will get to play for larger audiences than you might normally draw to your own shows, and that audience might get excited about turning out for your next headlining set. An added bonus, peppered in amongst those potential new fans might be members of the press and industry who may become contacts for future opportunities. Don't wait around for people to come knocking on your door, asking you to play their show. Follow these steps to get your name on the bill. What's the dream concert for your band? Who would you really love to play with? Make a short list and then find out who their agent and manager are. Get in touch with both, send them a promo package and let them know you're interested in playing with the band. At the same time, keep an eye on that band's touring schedule. When you know shows are in the works, reach out to the musicians' team and say, "remember me?" Agents and managers don't always get involved with picking the openers, but they often do, and being on their radar is always a good thing. As mentioned, agents aren't your only hope for getting on a bill. 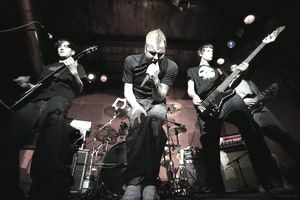 Often, the support bands are chosen by the venues or the promoters of the shows. If you are already a part of your local live music circuit, then these people should already be on your radar—and you on theirs. If you're not, get out there and make yourself known. Let the venues and promoters in your area know your band is always on the lookout for a good support slot, and that you hope they will consider you when they need an opener. Over time, you can put an emphasis on being one of the go-to opening bands for your area by working with local venues and promoters. Sometimes this may mean you're the "opener for the opener" on a three band bill, but it's a great way to build an audience while building relationships with bands, promoters, agents and venues that will be handy in the future. Make a contact database of all of the agents, promoters, and venues that you have identified as helpful to you in your quest to be the opening band. This one involves steps one and two and may seem like a drag, but when the perfect opening band opportunity comes along, you'll be glad you did it. Not only will you always have the info you need at your fingertips, but your database will help you keep track of people you share band news with—and if you haven't been, you should be! When you know that the perfect supporting act opportunity for your band is coming up, don't wait for your contacts to think of you; hit up the right agents, promoters, and venues to ask for the gig. Finding the opening band is one item people working on the show want to cross off their list, so the first band that asks often gets it. Act fast and be the first to throw your hat in the ring. Generally speaking, being the opening act doesn't pay particularly well in terms of cash. The real payoff is the chance to play in front of a larger audience and people who can help you in your career, like the press, labels, managers, promoters, agents and so on. If you refuse a good opening gig because you don't think the money is right, you're only hurting yourself. Incidentally, don't be afraid to be the "opener for the opener." That first band on a three or four band bill doesn't usually have the biggest crowd, but, on your local circuit, your willingness to pay your dues in these kinds of slots will help you get bumped up the bill in the future. Many opening bands are lucky to get a mention on a concert poster, so you should take promotional matters into your own hands. Send out a press release letting the local media know about your upcoming show. Be sure to announce it on your mailing list so your fans can come out and support you. And update your website to include the show. You may not get a very long set as the warm-up band, but you should treat it as you would any other concert. However, don't try to pass yourself off as the headliner. Make it clear in all your promo materials that you are the opening act. On very large tours, you may find that the opening slot is filled through a "buy-on." This means the opening band pays a fee to be on the tour. This kind of thing usually happens between major labels/major label artists and on stadium or arena tours. If you are an indie band or an indie label, don't sell your car to stump up the cash for a buy-on gig. Before you go buy-on, carefully weigh the risks and rewards. If the tour isn't going to generate increased interest in your band, then your buy-on fee won't be money well spent. Now that you actually have a gig as an opening band it is important to know how to act like one. Being chosen as the opening band for a more established act can mean great things for your music career, but all of those good things could evaporate pretty quickly if you violate some of the unwritten rules of being the opening act. Some of these rules might seem a touch frustrating but take the long-term view—making a good impression now is money in the bank for your future music career. Here are some basic etiquette rules all good opening bands should follow. There may not be a formal arrangement asking you to roll up your sleeves and help promote the show, but get on board and do what you can. Announce the show on your website, social networking sites and through your mailing list. Be sure to include info about the headliners in the promotion. Contacting the local press and radio may also be helpful, but consider checking with the show promoter before you do that. They may have plans for reaching out to the local media, and you don't want to step on their toes or muddle the message. Generally speaking, the larger the show, the larger promotion machine behind it, so check before making the media calls. When the headlining musicians, their management, agent or the show promoter asks you to be somewhere at a certain time, be there—even if you know everyone else involved in the show will be late, and you could end up standing around waiting. If something happens that will make you late—getting lost on the way to the venue, having a flat tire, forgetting an instrument, etc.—call someone and let them know. Even if they don't care, it's better to err on the side of showing that you respect the schedule than to hope everyone will be cool with you rolling in whenever you can. In most cases, sound check starts with the headliners and ends with the first opening act. The reason for that is partly a practical one; the first opener will take the stage first, so by sound checking last the stage is already set up with their gear so the show is ready to start. However, the reason is also hierarchical. Allowing the headliners to get the first crack at soundcheck means they can take their time and sound check until they feel good about their set. Sometimes, this means the headliners take up most—if not all—of the sound check time. That means, of course, the opening act gets little or no time to check their own sound and get comfortable with the stage/acoustics. For an opener, that can cause some serious stress but just grin and bear it rather than kicking up a fuss. Sure, it would be great if the headliners made sure everyone got a sound check, but it is their show and taking their time is their prerogative. Before you assume that you'll be setting up a merch table the night of the show, discuss it with whoever booked you for the gig. Have a discussion about this before the night of the show. Sometimes headliners (or their reps) frown on support bands selling their merch because any money thrown your way is money not spent on the headliners' merch. That may rub you the wrong way, especially if the headliners are making big bucks for the show while you're getting a pittance, but you're bound by the rules set by those who invited you to play the show. Even if it feels like the audience is eating it up and you're having a great time on stage, wrap up your set when you're supposed to. When you run over, you take time away from the headliners. It's important that they get their full set, or if they don't that it's not your fault. Remember, the headliners are who the audience has really come to see. Be glad you made some new fans and promise them a longer set in the future. Unless there is a good reason why you have to play and dash—you've got a plane to catch, a 14-hour drive home, an illness or something along those lines—don't skip out before the headliners play their set. Yes, even if they are not your favorite band, stick around and watch them play. Offer a quick thank-you to everyone who helped you land this opportunity and everyone who helped the show run smoothly. From the headliners and their reps to the venue manager and sound engineer. A simple thank you goes a long way. What Should You Do if Your Gig Was a Flop?